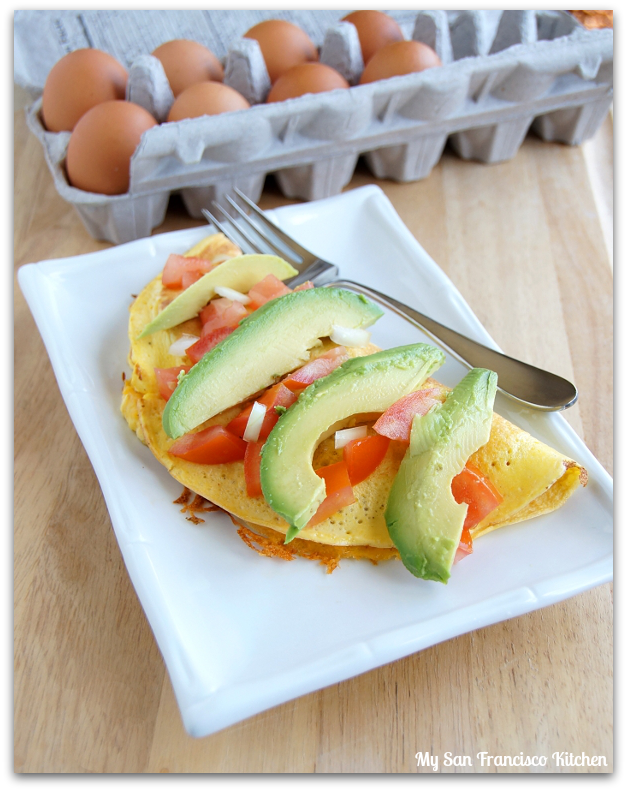 This is a great omelet to have for breakfast, lunch or dinner. One of my favorites. 1. Grease a large skillet with cooking spray, butter or oil and heat it over medium heat. 2. Add eggs, salt, and pepper to a medium bowl. Stir together gently, don't beat. 3. Dice the tomatoes and onions and slice the avocado; set aside. 4. Pour ½ of the egg batter into the skillet and cook for about 5 minutes (turn over a little to peak underneath – it should be firm but not browned. It is okay to let some of the uncooked egg flow underneath to cook. 5. Once ready, flip over. 6, Sprinkle 1/2 of the cheese, pepper, tomatoes and green onions over the omelet. 7. Add a few slices of the avocado. 8. After a few minutes of cooking, flip half of the omelet over onto itself and transfer to a plate. Top with extra cheese, tomatoes, onion and avocado slices for a finished look! 9. Repeat with the other 1/2 of the egg to make the second omelet.